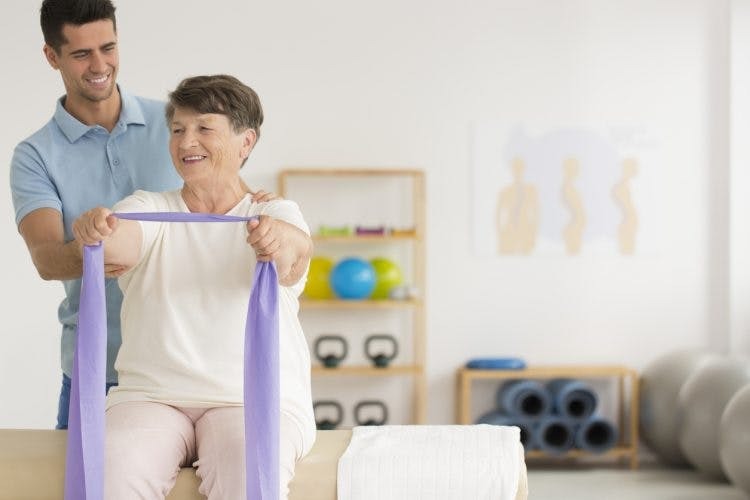 Below you will find our best exercises for stroke recovery. Before we get into the exercises, though, we’d like to explain why you should focus on repetition while exercising. Repetition is incredibly important during recovery because it activates neuroplasticity. Neuroplasticity is the mechanism that your brain uses to rewire itself after injury. It’s how neurons form new connections in your brain. These new connections help restore movement in your body (among numerous other functions). And in order for neuroplasticity to take place, you need repetitive practice. Each time you repeat an exercise, you strengthen the connections in the part of your brain that controls that movement. The more you practice, the better you’ll get. So focus on good repetition and you’ll set yourself up for success. Some of the best core exercises for stroke recovery involve isolation. Two excellent stroke exercises that isolate your core safely are trunk rotations (twists) and lateral trunk flexion (oblique crunches). From a seated position, place your right hand on the outside of your left thigh. With your back straight, use your arm to help twist your torso to the left. And if you can’t move your right hand, then you can use your left hand to assist it. Be sure to keep your spine straight and don’t twist to the point of pain. Aim to engage your core and get a good core exercise in. Repeat on each side 5 times. From a seated position, dip your left shoulder down towards your left hip. Then, return to an upright position by focusing on using your core to pull yourself up. If you can’t fully complete this exercise yet, then you can use your arm to push yourself back up. For this exercise, sit in a chair and lift your affected leg slightly off the floor. Your leg should remain bent at 90 degrees, but your foot should hover over the floor. Then, kick your leg outward like you’re kicking a ball. Then, kick your leg inward. Try to perform 5 repetitions. 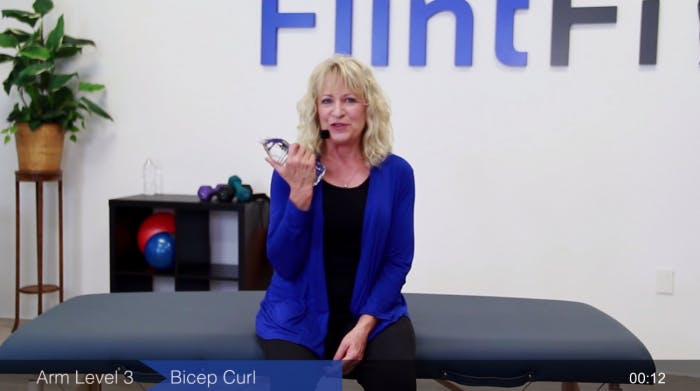 When you exercise your arms, it’s important to focus on your arm and shoulders. Be sure not to neglect your shoulders. While seated at a table, place a water bottle arms distance in front of you. Then, make a fist with your affected hand as best you can and glide your forearm across the table and punch the water bottle. Be sure to keep your elbow and forearm on the table. Pay close attention to shifting your weight into your affected side and try your best to avoid letting your affected shoulder lift. Elevating your affected shoulder is your body’s way of compensating for weakened or stiff shoulder muscles (and avoiding compensation is the best way to get better). To perform a bicep curl, grab a water bottle or dumbbell and hold it parallel to the floor. Then, bring it up towards your shoulder while bending at the elbow. Be sure to keep that elbow glued to your side. Too difficult? Ditch the weight and prop your arm up on a table, keeping your elbow stationary on the table to isolate your bicep. 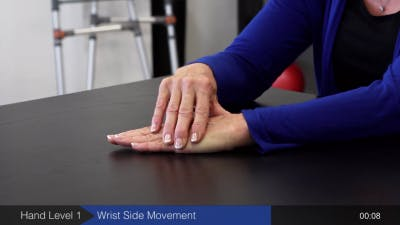 Place your affected hand on the table with your palm down. Then, use your non-affected hand to slide your hand to the left and then to the right. Focus on initiating the movement solely from your wrist. 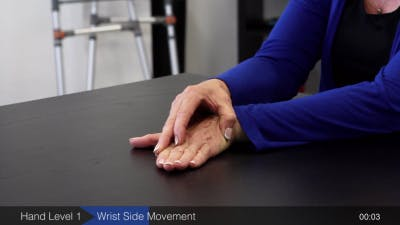 Place your affected arm on the table and place a water bottle in your affected hand. Keep your hand and fingers relaxed. Then, curl your fingers in and grasp the water bottle in your hand. Then release back down. 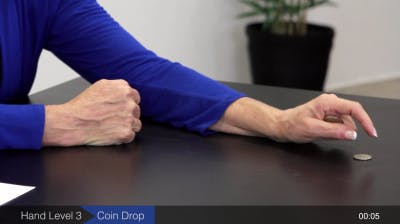 For this exercise, start by placing 8 quarters in a row in the palm of your affected hand. 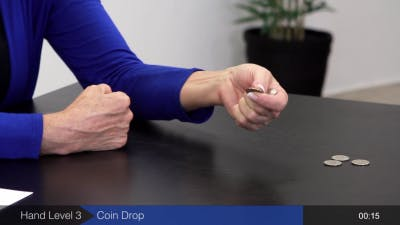 Then, use your thumb to slide one quarter down into your index finger and thumb, so that you end up pinching the quarter with your index finger and thumb. Then, place the quarter down onto the table while keeping the other quarters in your hand using your other fingers. Exactly How Many Reps Is Enough? Each of these exercises requires 5 repetitions each. If you make your way through the entire article, you will complete a little more than the average traditional therapy session (which typically includes 30-40 reps). So if you complete everything, good job! You did enough. But this bring up a great question: how many repetitions should you do if you want to see stellar results? The answer is, a lot. Preferably, anywhere around 400 reps will generate massive results. And if that sounds overwhelming, don’t worry. Rehab tools like our FitMi help you achieve up to 12 times more repetition in just one half hour session, so that you get the high reps you need to rewire your brain effectively. FitMi has helped our customers see much faster results than traditional therapy — sometimes seeing results within just 3 days! You can read their success stories here. We hope you enjoyed these exercises!